Germany in the NES version of Mario's Time Machine. Germany (German: Deutschland) is a country in Central Europe. 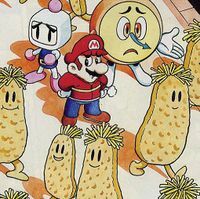 Until 2002, the country had its own Club Nintendo magazine which included many Mario comics. One of them, the comic "Sag niemals Holerö! ", is set mainly in Germany. Its capital city is Berlin. In this story, Mario vacations in Switzerland, but soon is frightened off by the fact that all of the humans around him strangely turn into food. He decides to go to Germany by train, and travel back home to New York City from there. On his way to Germany, he meets TicToc and Bomberman, two people who have not been transformed into food. Since even in Germany the denizen's appearance has changed (it turns out that all people have turned into a type of food typical of the country they live in, so the Germans have turned into cutlets and French fries), the three of them decide to find out what has happened. On the train to Germany, they stumble across a Toad called Todojewski who gives them the advice to go to a place called Taj Mahal. The rest of the story is set in Frankfurt, a large city in Germany. As it turns out, Taj Mahal is a restaurant in this city, and inside, Mario, TicToc and Bomberman meet a man called Mahgo. He informs the friends that each one of them has a special ability they can make use of when fighting Heini, an evil alien that has caused all the transformations. They finally find Heini in Frankfurt's Alte Oper, where he is trying to serve the transformed humans to his alien fellows. Using their special powers, Mario and his friends manage to defeat Heini and the other monsters and thus to save mankind. In the NES version of Mario's Time Machine, Mario travels back in time to an unnamed location in Germany circa 1905 to return Albert Einstein's famous Physics Equation to him. More specifically, Mario also time travels to Mainz in 1455 to return a Metal Type to Johann Gutenberg and to the Berlin Wall in 1989 to return a Sledgehammer to help topple the wall. Grace, a playable character in Mario Golf and Mario Golf: Advance Tour, was raised in Germany, according to the Japanese website for Mario Golf. This page was last edited on April 3, 2018, at 13:16.